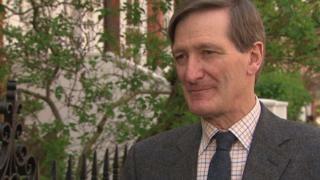 Conservative MP Dominic Grieve has said he is the victim of an "orchestrated campaign" after losing a vote of no confidence brought by his local party. Party association members in Beaconsfield, Buckinghamshire, reached the decision at a meeting on Friday. Mr Grieve said: "Quite a large number of people had clearly come with one fixed objective only." He added: "It appeared to be an orchestrated and organised campaign, which seemed to have required signing lots of people up to my association over quite a short period of time." The former Attorney General said the move against him had been organised by Jon Conway, who had been readmitted to the party after standing for UKIP in Beaconsfield in the last election. Mr Conway said he had been only one person at the meeting. He said of Mr Grieve: "He's never really believed in the idea [of Brexit] and he's become very outspoken. But he's the rebel, not us." John Strafford, who lives in Beaconsfield and is the chairman of the Campaign for Conservative Democracy, was one of the architects of the vote. He said that Mr Grieve had stood on a manifesto in 2017 supporting the UK's exit from the European Union. "He voted for Article 50, which actually gave a date of March the 29th to leave the European Union," Mr Strafford said. "He has betrayed the people of Beaconsfield and the nation by continuously opposing and obstructing that decision from being implemented." A number of Conservative MPs have criticised the no confidence vote including Boris Johnson, who called him "a good man" in a post on Twitter. Mr Grieve, an MP for 22 years, said he had no intention of standing down but would now need to ask the local association to reselect him as a candidate in the next general election.